Here is the other T-shirt idea I mentioned below. Sweet Colleen, introduced me to the idea of bleach dyeing in a conversation one day and it stuck with me. 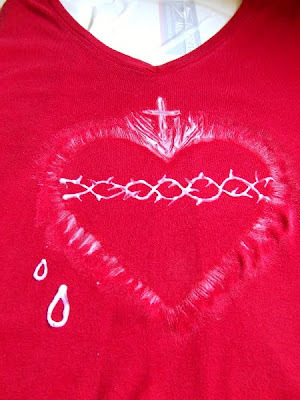 I thought this idea would be great for a sacred heart image for myself since, frankly, tie dye isn't really a fashion choice I prefer. Here's how to do it. 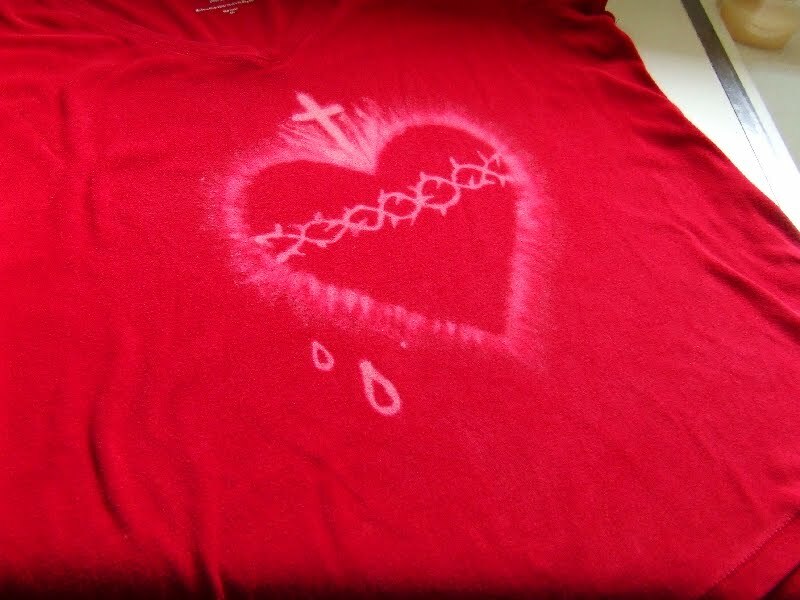 I took an old, red T-shirt and a bleach pen, the kind with two tips, a broad one and a fine one. (Be warned: it must actually contain chlorine bleach not color safe bleach. 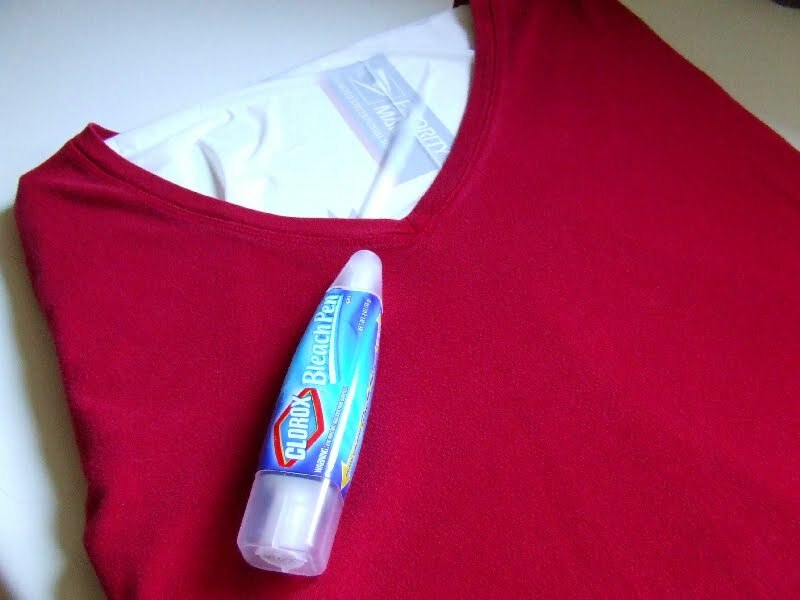 Also, Tide to Go is not a bleach pen, it's just for stains.) 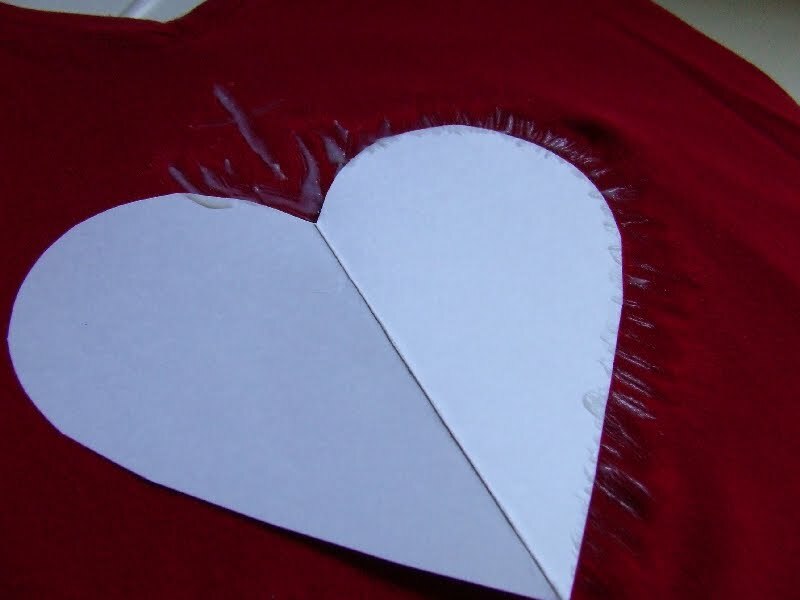 I placed some cardboard covered in a trash bag between the layers of the shirt so that the bleach wouldn't leach through to the back. 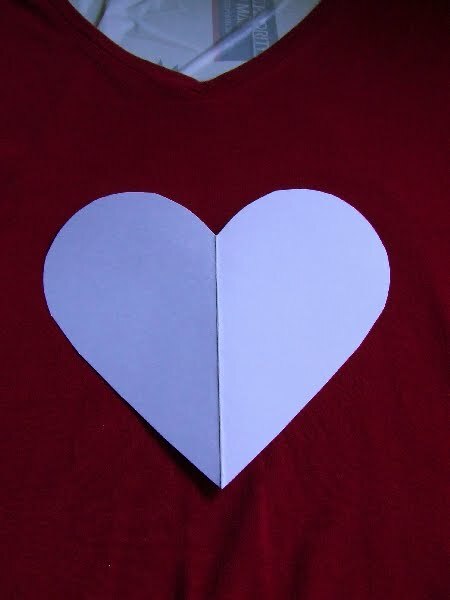 Then, I cut a heart shape out of card stock and centered it on the shirt. I didn't attach it or anything, just pressed it down with my hand or a can would work well too so that both your hands are free. Using the broad tip, I made the cross and the flames, then scraped the bleach outwards from the edge of the heart all the way around. Once the outline was finished, I used the fine tip to draw the thorns and drops. I left the bleach on for approximately 45 minutes. I was afraid to leave it on longer since it is an older shirt. I didn't want the bleach to damage the fabric. 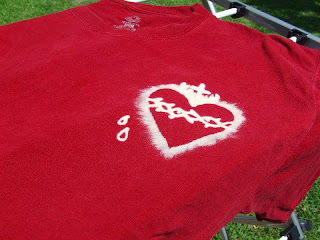 When the timer went off, I dipped my shirt in the vinegar, but you should just pour the peroxide over the bleached area. Rinse with water. Wash and dry. One little tip: If you want to see what color your shirt will bleach to, you can test a small spot with a dot of bleach on the inside hem of your shirt. The children insisted that Husband had to have a shirt too so I made a smaller/pocket version for him (except that his shirt didn't have a pocket). As you can see, Husband's shirt bleached faster and whiter than mine. That's why I recommend testing a spot and timing how long it takes to get the look you want. The Solemnity of the Sacred Heart isn't until this Friday but today is the feast of Corpus Christi and Colleen's white chocolate bread pudding sundae is sounding too good to pass up after the heat wave we had yesterday! 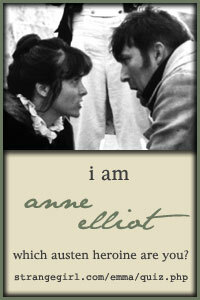 Happy Feast Day! What a great idea Charlotte! Thanks so much for sharing it. I really like the way your shirts turned out! Wow those are beautiful shirts. What a great idea! 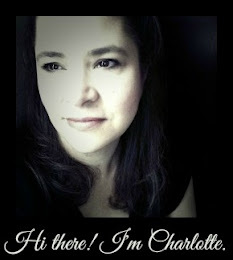 Oh CHARLOTTE!!! Those turned out SO beautiful!!! 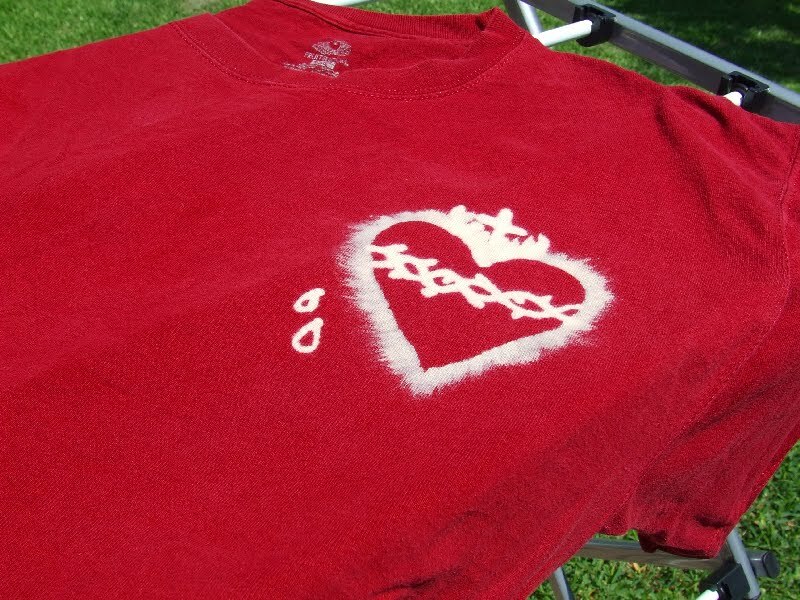 An easy way to do bleach dying if kids want to participate is to let them sketch their design in washable markers, then have an adult go over it with the bleach pen. The marker washes out when you wash it and the bleach design stays.